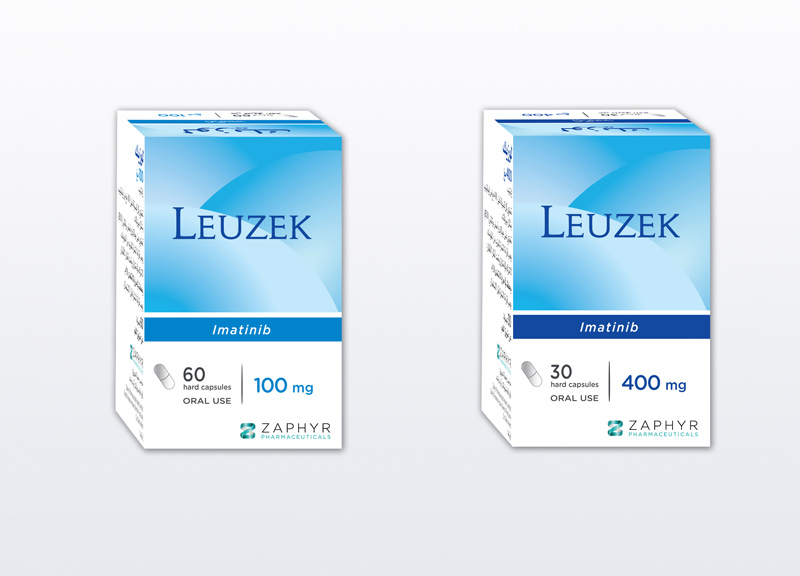 Name: Leuzek (imatinib) hard capsules. Description: Leuzek (imatinib) The mesylate salt of imatinib is a tyrosine kinase inhibitor with antineoplastic activity. Imatinib binds to an intracellular pocket located within tyrosine kinases (TK), thereby inhibiting ATP binding and preventing phosphorylation and the subsequent activation of growth receptors and their downstream signal transduction pathways. This agent inhibits TK encoded by the bcr-abl oncogene as well as receptor TKs encoded by the c-kit and platelet-derived growth factor receptor (PDGFR) oncogenes. Inhibition of the bcr-abl TK results in decreased proliferation and enhanced apoptosis in malignant cells of Philadelphia-positive (Ph+) hematological malignancies such as CML and ALL; effects on c-kit TK activity inhibit mast-cell and cellular proliferation in those diseases overexpressing c-kit, such as mastocytosis and gastrointestinal stromal tumor (GIST). Acute lymphoblastic leukemia (Ph+ ALL) integrated with chemotherapy in adults and children that is Philadelphia chromosome positive. In adults, it is used for disease that has recurred or is refractory. In children, it is used as the first treatment after the disease is diagnosed. Advanced hypereosinophilic syndrome (HES) and/or chronic eosinophilic leukaemia (CEL) with FIP1L1-PDGFRα rearrangement. Chronic myelogenous leukemia that is Philadelphia chromosome positive Ph+ CML, paediatric patients with Ph+ CML in chronic phase after failure of interferon-alpha therapy, or in accelerated phase, for whom bone marrow transplantation is not considered as the first line of treatment. Unresectable dermatofibrosarcoma protuberans (DFSP) and adult patients with recurrent and/or metastatic DFSP who are not eligible for surgery. Myelodysplastic/myeloproliferative diseases (MDS/MPD) associated with platelet-derived growth factor receptor (PDGFR) gene re-arrangements.